How is life in Iraq since the death of its dictator Saddam Hussein in 2006? It's possible to find some answers to this question in this exhibition by Iraqi Kurdistan photographer and filmmaker, Jamal Penjweny. A very realistic panorama of Iraq nowadays is showed in photographies and videos presented at the Ikon Gallery, from 19 February to 21 April. Saddam is Here ( 2009-2010) is a solo project consisting of a series of twelve images of Iraqi people in familiar locations, holding a life-size picture of Saddam Hussein's face in front of their own. A clear reference to how Hussein is yet (and always will be) influencing people's life in the country. Or as explained in the words of own Penjweny: "Saddam is here. Iraqi society can not forget him even after his death because some of us still love him and the rest are still afraid of him…His shadow is still following Iraqi society everywhere." The exhibition also presents a short film entitled Another Life (2010), where Penjweny follows some Iraqis smuggling alcohol from Iraq into Iran. It is an emotional and dangerous example of how these men risk their lives. Without Soul ( 2011) shows daily scenes of people in the country. People who go to work, go to their temples to pray and the western soldiers who are also part of the city's scenery. All these people are marked with a single red line drawn across their necks, which is an interesting reference that can be better understood by visiting the exhibition itself. 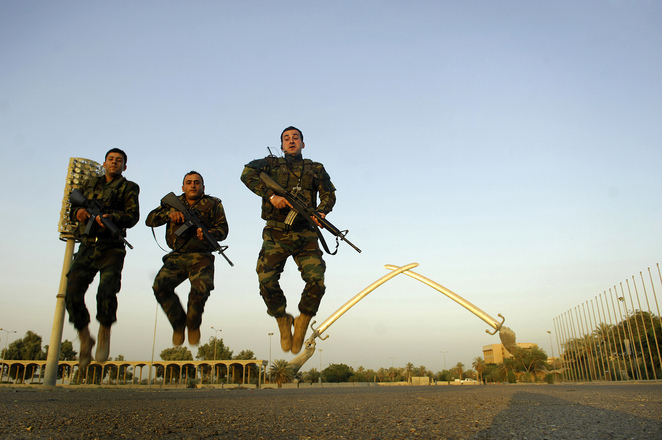 Finally, the series of photos Iraq is Flying (2006-2010) shows children jumping while photographed; symbolising the joy of the youth that seems to be lost in the middle of the hard life they face nowadays. Saddam is Here is the opening exhibition of Ikon 50, part of the year's programme celebrating Ikon's 50th anniversary.